Please feel free to share these materials on any of your platforms and with your network. The Florida Department of Transportation’s new 511 Traveler Information System has enhanced features, a new look and the same real-time traffic and travel information you’ve come to rely on. The new 511 system includes a new website, mobile app and easier access to the information you need. These updates will enhance your Florida 511 experience, and make it easier to receive real-time traffic and travel information. The new website tells you about incidents and alerts on your desired route, and provides directions and alternate routes. Florida 511 provides real-time traffic and travel updates on all of Florida’s interstates and toll roads, and other major metropolitan roadways. During an emergency, 511 is an essential service to inform you of severe weather alerts, evacuation routes, road and bridges closures, toll suspensions, and more. Stay tuned for more information on all of these updates; and follow us on one or more of our 13 statewide, regional or roadway-specific Twitter feeds. The Florida Department of Transportation (FDOT) is proud to announce a system-wide update to Florida’s 511 Traveler Information System; with a new mobile app, website and phone system geared to enhance the user experience. 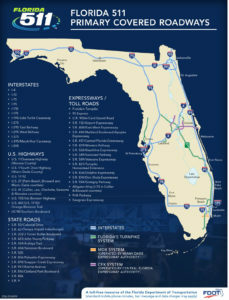 Florida’s 511, the state’s official source for real-time traffic and travel information, has added state-of-the-art features across all of its platforms while continuing to provide incident, construction and congestion information on all of Florida’s interstates and toll roads, and other major metropolitan roadways. The new, mobile-friendly website features driving directions, point-to-point travel times, and alternate routes, alongside the traffic information to which users are accustomed. FDOT is also introducing weather forecasts and severe weather alerts supplied by the National Oceanic and Atmospheric Administration (NOAA). The innovative new “My Cameras” feature allows registered users to store a list of traffic cameras that provide an important, live look into the conditions along their route. The new Florida 511 mobile app features turn-by-turn navigation, with real-time traffic updates, alternate routes, and improved travel times on roadways, along with all of the added features coming to the new site, while the updated phone system will provide more streamlined call navigation menus, getting you to the information you need more efficiently. A #NewFL511 from @MyFDOT! New website, new features, same great traffic information.
.@MyFDOT’s #NewFL511 is here! Visit FL511.com and download the new Florida 511 mobile app to experience the new features. Travel directions and personalized camera list all in one place. #NewFL511 mobile app and website from @MyFDOT! Learn more about the #NewFL511 and its new features. Sign up for the monthly 511 newsletter at http://news.fl511.com/newsletters! Turn-by-turn travel directions, weather forecasts and personalized camera lists on the #NewFL511. Follow #FL511 for updates. The #NewFL511 mobile app: turn-by-turn directions, point-to-point travel times! Download it today for Apple and Android. The improved and updated Florida 511 Traveler Information System is here! The free and easily accessible service provides more features and the same reliable, real-time information to keep Florida moving. Do you use FDOT’s 511 Traveler Information System? FDOT’s new system helps keep Florida moving. If you aren’t familiar with 511, it’s a free service that helps motorists stay up-to-date on crashes, congestion, construction and more. The 511 system provides real-time information on all of Florida’s interstates and toll roads, and other major metropolitan roadways. Stay tuned for more information on the new system. FDOT unveils updates and improvements to the Florida 511 Traveler Information System! Check FL511.com for more information. Blue Alerts notify the public when law enforcement officers are searching for an offender(s) who has killed or seriously injured a law enforcement officer. A brand new Florida 511 is here! With The Florida Department of Transportation’s new 5-1-1 Traveler Information System, you can create door-to-door routes with turn-by-turn directions, which include alternate routes, travel times, incidents and weather information. Know before you go. Keep Florida moving with the new 5-1-1. The Florida Department of Transportation’s new 511 Traveler Information System has enhanced features, a new look and the same real-time traffic and travel information you’ve come to rely on. New website, mobile app and easier access to the information you need. Now, you can create door-to-door routes with turn-by-turn directions, which include alternate routes, travel times, incidents and weather information. Follow one of our thirteen (13) twitter feeds to learn more and know before you go. Keep Florida moving with the new 511.